The Department of Performing Arts and Visual Culture is home to the museum studies degree program as well as minors and immersions in the areas of music, theater, archive development, and visual cultural studies. 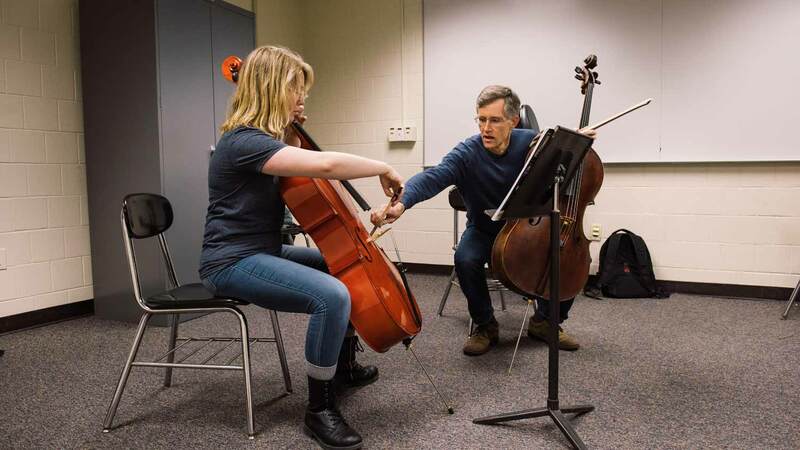 The department offers the opportunity both in and out of the classroom to participate in musical ensembles, theater performances, and other experiential learning opportunities. We believe that the study of fine arts empowers our students to use technology in creative and innovative ways. The faculty come from a diverse range of scholarly, performance, and creative backgrounds and are highly respected scholars in their respective fields. Meet three students who were nominated to attend the Kennedy Center American College Theater Regional Festival. Mystery, murder, dance, a look at deaf life, and the struggle to survive Nazi Germany are all part of a new collaborative season by RIT’s National Technical Institute for the Deaf Performing Arts program and College of Liberal Arts Theater Arts program. Students complete a set of core courses that focus on the fundamentals of museum studies, including the history, theory, and practice of institutional collecting, exhibition design and development, public history, collections management, fundraising and grant writing, and a range of digital technologies used in the collecting field. All of the program courses include hands-on experiences and field trips to cultural institutions. To broaden and deepen your knowledge, you will choose a professional track in museum studies or public history. Here you will find additional resources for the Department of Performing Arts and Visual Culture, such as music performance spaces, music rooms, practice rooms, and musical instrument inventory and storage policies.